The Astra Dining Chair is a classically designed wood dining chair that will fit easily into a wide range of decorative schemes. The modern dining chair's style is a clean-cut and restrained with echoes from styles like Shaker and Mission, yet with a definite contemporary approach to the angling of its top rail. Comfortable seating and easy care are assured by the faux-leather or fabric upholstery over fire resistant foam seat filling. 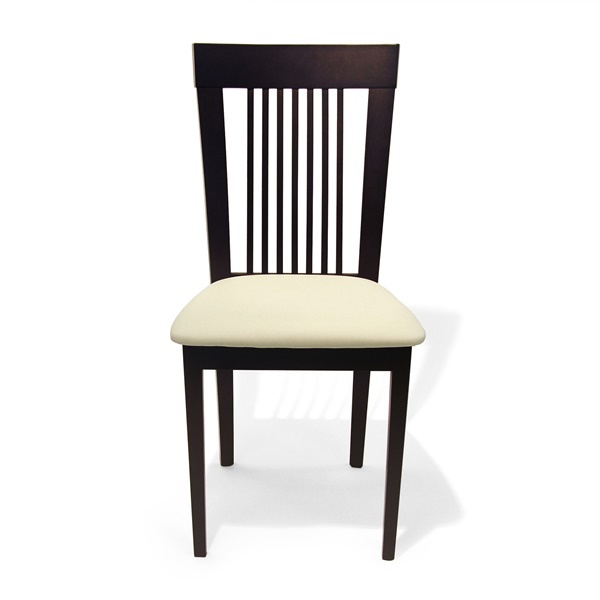 Made from solid beech, the Astra Dining Chair is available in your choice of finish. These dining chairs are incredible! Really love the cream colored seat cushion against the dark wood finish, beautiful! great transition from traditional into contemporary! These are the perfect transition from a very traditional style to a contemporary style which was definitely needed coming from someone who doesn't work well with sudden changes! Impressive and affordable! Always good to order from here - rarely disappoint but this time there was a bit of an issue with the color on the finish in terms of matching correctly with my dining table, it's not extremely different - but i still suggest asking for color swatches if you have any concerns - on the plus side, customer service was very helpful and accommodating - thanks! Great set of chairs for my first apartment, the design is very simple but its sophisticated and i feel like I can really play around with the rest of the decor. Items arrived quickly and they look great! Ordered a set of 4 to go with my dining table! They are elegant, comfortable and sturdy! Very easy to order! Received item, well packed, no problems at all. Chairs are sturdy and are as shown in the photo. The padding is on the scant side but can be recovered easily and more padding added. I like the way these chairs look and feel. The walnut finish is beautiful. Assembly could use better instructions. How many pounds can the chair hold? Can I order the chair with walnut frame but not the cream pad (I mean different color)? This chair is rated for use up to 250 lbs. At this time, you can only order the chair in the selections shown in the drop down menu.